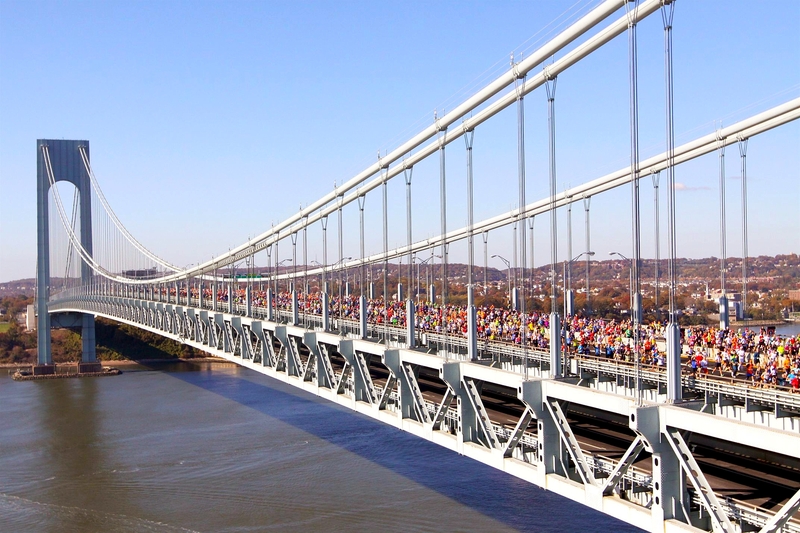 I asked the huzband to take some time to write down, while it was still fresh, his experience during the NYC Marathon. And write he did! Be forewarned, it’s a long one but it’s an oh-so-good one too! I’m so proud of the huzband, his dedication, hard work, compassion and love for others. To go along with my Thankfulness posts, I am so extremely thankful for my husband, who he is and his desire to change the world one child at a time. He truly is inspiring! ** all photos are from Brightroom Photography unless otherwise noted. 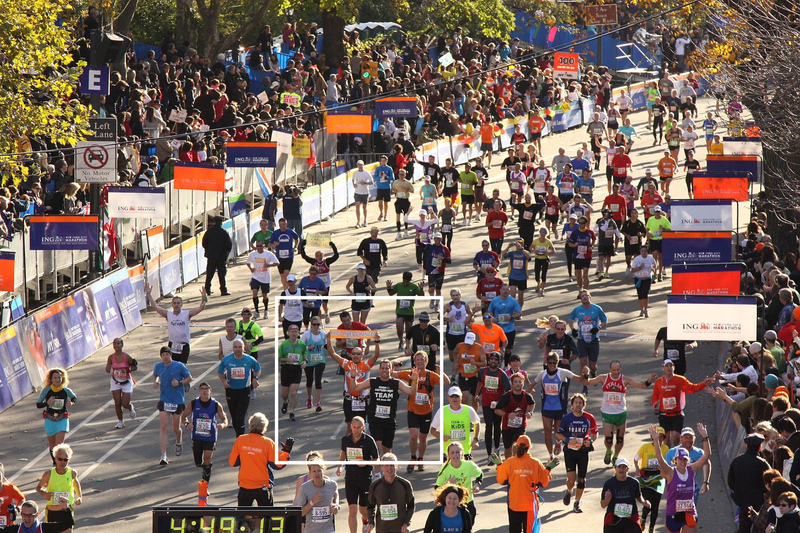 The ING New York City Marathon is one amazing race. In my humble opinion, it is the greatest! 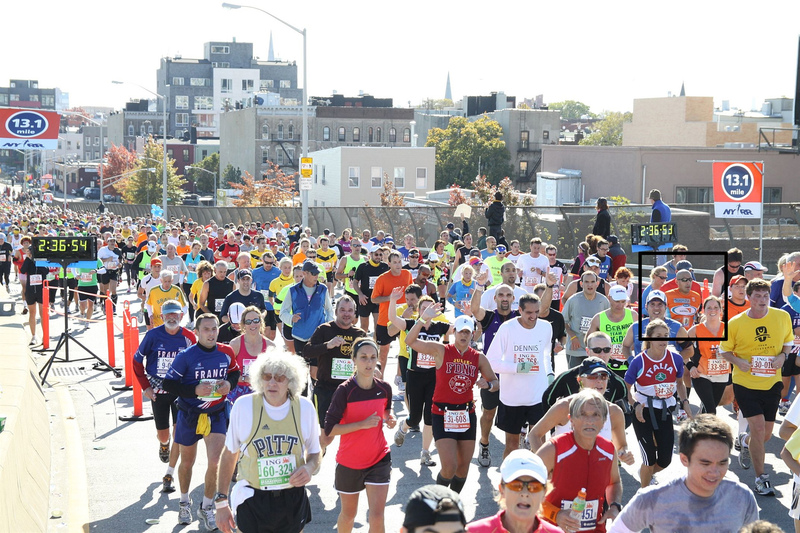 Forty-seven thousand runners show up race day to run 26.2 miles visiting all five boroughs of NYC. The city literally comes to a stop. 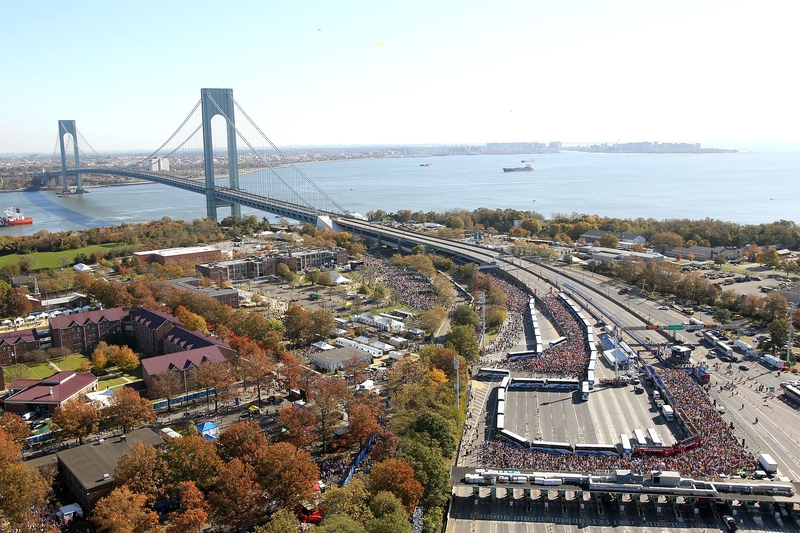 Bridges are closed, roads are blocked, helicopters are hovering and millions of people come to witness this spectacular race. I found myself getting up about five hours prior to the beginning of the race. I woke up at peace, with a great sense of confidence and excitement. 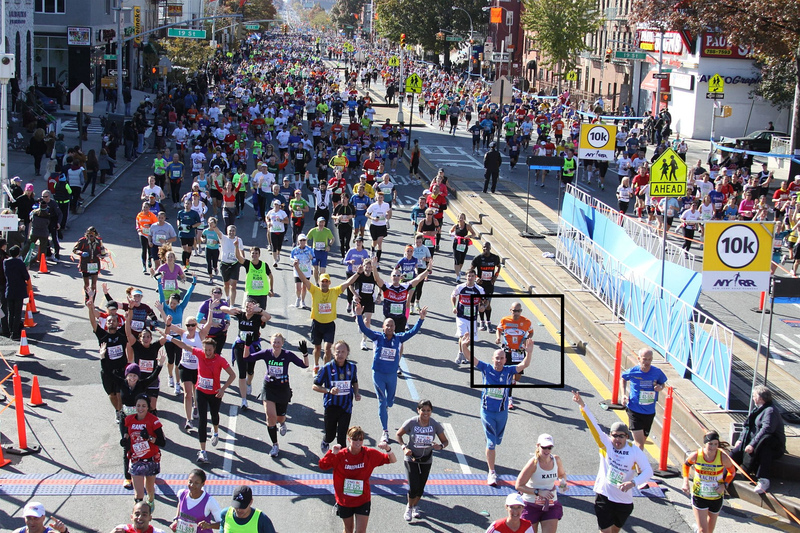 I had done all my training, all my homework and this time around I was much smarter than my previous NYC Marathon. I left home about 5:40 am. The plan was to take the train into the city. From there catch the subway to the ferry, to a bus and finally meet up with some of the Team World Vision (TWV) teammates to pray and encourage each other one last time. However, that’s not quite what happened. I didn’t read my train schedule properly so on my way to the train station I saw my train come and go. No problem; I had my rock star teammate Rusty Funk with me. He just completed a 100 mile run a few weeks before coming, so what’s a missed train! So I headed to a different train station and was now running 13 minutes late. Once I finally arrived to Penn Station, I decided to jump in a cab instead of taking the subway. I later found out that was a great idea! A lot of people got stuck on the subway. I recovered the 13 minutes I had lost as the taxi driver flew down the West Side Highway. Back on track and right on time. Once on the ferry I had an amazing surprise. Three teammates showed up: Pastor Jerry O’Sullivan – 2011 Lake Placid Iron Man finisher, Pastor Chris Coats – running his second marathon in less than a year and David Taylor – crazy English guitar and soccer player who got tons of kids sponsored through the campaign. Really, I cannot believe I get to hang out with such quality men of God and call them my friends. We joked around and enjoyed the ferry ride. Upon our arrival to Staten Island, Jerry got separated from us (or we got separated from him – he ran way ahead). Chris, David and I jumped on a bus. You could feel the anxiousness building inside the bus; runners speaking different languages, traveling near and far to run this marathon. It was awesome, at least until the bus driver got lost. Yes, you read correctly, our bus driver got lost. A ride that was supposed to take about 13 minutes from the Ferry Terminal to the start of the race was now taking almost an hour. In all fairness, the bus driver was simply following the (wrong) directions from a cop. So here we were, a bus full of anxious runners on their way to run the greatest race in the world, going in loops and circles. To say runners started to lose patience would be a bit of an understatement. I now knew I was running late for our team meeting and was in danger of missing my corral. So I texted my good friend Ben Ward and asked him to cover for me. Ben is one of my favorite people in the world, a rock star champ. He and his wife Olivia, Biggest Loser Champion of season 11, have truly transformed their lives in the past year. Back to the bus, one particular runner was completely losing it. He was cursing and yelling at the bus driver. He actually asked to get off the bus. I was trying to relax and keep cool but this guy was starting to rally the troops. He made a racial reference to the bus driver and it was then that I decided to step up and do something. So I pulled a Juampa, as my wife likes to say. I called out to the guy, “DO YOU WANT TO GET ARRESTED?” He was shocked, replying with a calmer voice, “Do I want to get arrested?”. So I said again with a firm voice, “YES, DO YOU WANT TO GET ARRESTED?” He softly replied, “No”, while sitting down. I could tell Chris and David’s mouths dropped. Hey, I need to take care of my teammates and keep things cool. We never heard from the guy for the rest of the ride. We finally made it off the bus after almost an hour. I missed meeting up with my runners. I was only able to connect with two teammates, Jeff and Natasha. They are awesome. They were running the NYC Marathon as an engaged couple! I not only missed my runners but I also missed my corral and wave but in another brilliant Juampa move, I convinced a NYC cop to let me in on the rear of it all. I was back on track. By this point I had lost all time to think about the race, I just found myself in it. During the first few miles I came across a few team mates; it was so refreshing to see them. My goal for this race was to simply run it from beginning to end. I did want to break the 4 hour mark, however ultimately I was not too concerned with time. The first 13 miles of the race went by so fast. Really, I wish I could tell you about them but I was so focused on praying for my teammates, the ones running as well as the few that had to drop out for either personal or health reasons. My teammates are all rock stars! I could tell you one by one about their awesome, inspiring stories. I am so honored to be a part of such a wonderful team. Some of them were celebrating giant battles they overcame in their lives, from weight loss to emotional trauma. I also prayed for the over 400 sponsored children in this campaign. You see, that is the ultimate reason why we were all running. We truly believe we can change the world one child at a time. Here in America we take so much for granted. As I was running I made a conscious decision to meditate upon what ever the miles brought my way. When I was thirsty, I celebrated water and Gatorade. I truly thanked God, I prayed and I cried for the millions of people in the world that do not have clean water. When I was taking my gels (pretty much calories in semi liquid form), I thanked God for every meal I share with my family. I cried often throughout the course and prayed for all the mothers that don’t have food for their babies and for all the children that go to bed hungry every night. Around mile 14 I was overwhelmed thinking about these 400 lives that will never be the same. I texted my wife a few times on the course to let her know how I was doing. Everything was going great. I was holding back, reserving energy and felt super encouraged. My plan was to wait until mile 20 and then let loose. 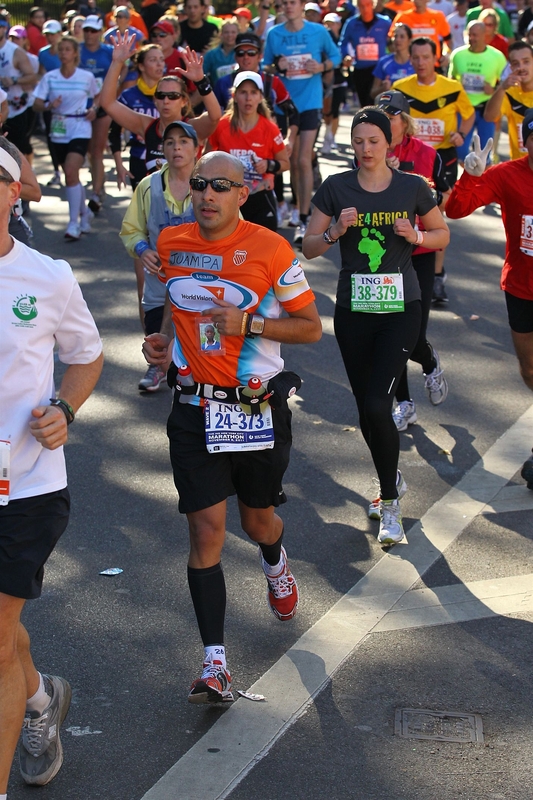 However, around mile 19 I experienced something I haven’t ever experienced while running. The back of my left leg started cramping. I stopped and stretched a bit. It helped for the moment but after a few yards it came back. At that moment, I remember walking and looking at the floor wondering what had happened. I started to get upset and frustrated; I did not want a repeat of last year. I am sure my body was going crazy after almost 3 hours of running. As I looked down, my eyes focused on a picture I clipped to my jersey. I lost it; Juampa, Mr. Cry-Baby. That was a truly holy moment; one not inside the church nor with my bible in hand. It was in this moment that I could hear a whisper that said, “She used to do this every day”. You see, the little picture clipped to my jersey was of Diana, the child my wife and I sponsor. She lives in Kenya and her job, before World Vision came to her village, was to walk miles upon miles each day to fetch dirty water for her family. Now, they have clean water within her village. That is what got me to mile 22. Once I arrived there, there was a large screen where I read a message by the Coats family (Pastor Chris from the bus ride and above video). I don’t remember exactly what it said. All I do remember was “Team World Vision…Juampa…the Coats family…love you.” Here again I found myself deeply moved. Their encouragement carried me to our official TWV Cheer Station. I could see it from a distance. As I approached the station I saw so many familiar faces. I saw my family and that was simply awesome. I slowed down and held up my sign (400+ lives changed). What an emotional moment. I wanted to stop and greet everyone one at a time but walking made the cramping worse. I wanted to stop and kiss my lovely wife and child but I had decided before hand that I needed to continue on. The last 3 miles were hard, very hard. At no point of the race did I feel I hit the wall. My heart rate was steady and I felt full of energy. Besides the cramps in my leg, it was an awesome race. As I approached the finish line, I once again pulled out my sign and ran with it held high in the sky for the last few hundred yards. I was and still am so proud of my team and what we, as a team, have accomplished. I was so thankful to God for this opportunity. 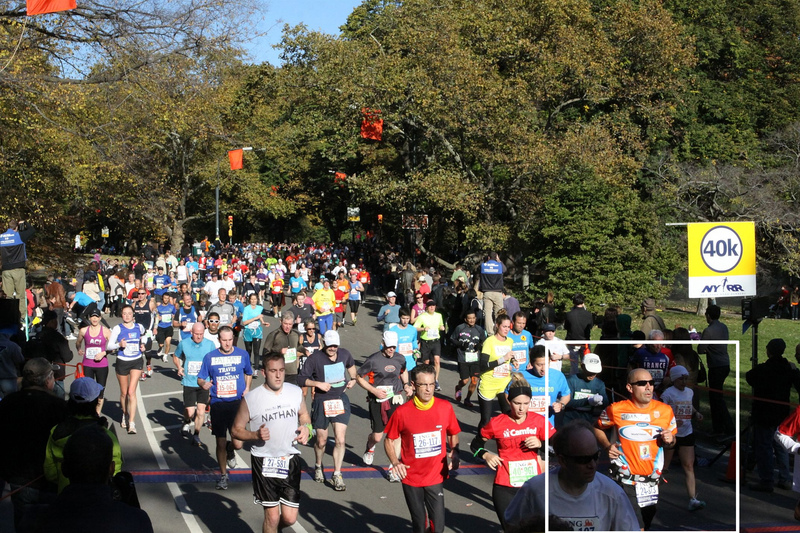 People were cheering loud for the runners, it was electric but I kept focused and talked to my Creator. I thanked Him for this journey, for every runner, for the help that is on its way to desperate communities and for my little girl Diana, who has truly changed my life! 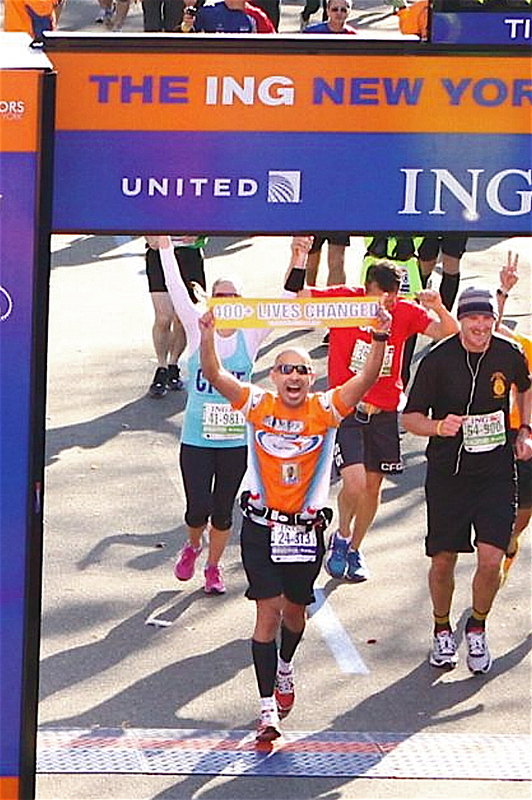 As I crossed the finish line I let out a burst of energy deep from within my spirit to God. It was truly an act of worship and celebration! The honest truth is, we can change the world – one child at a time!! 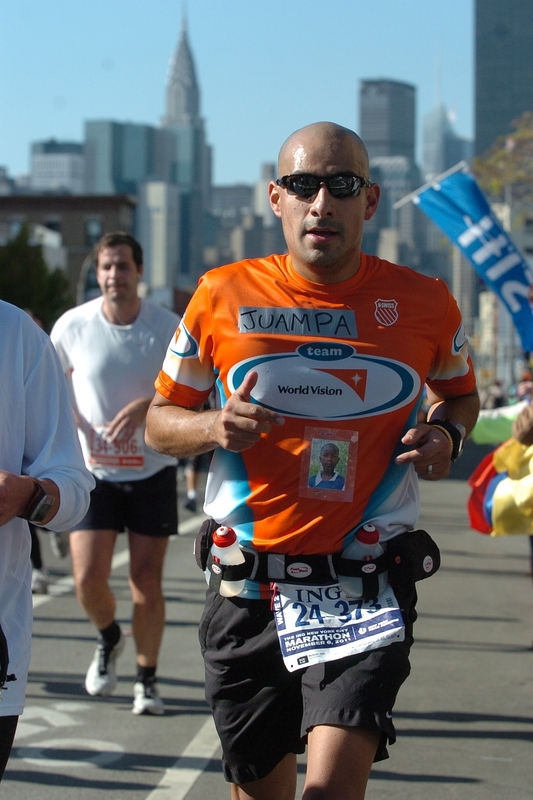 I am so proud to be a Team World Vision runner! Juampa this is a beautiful story. 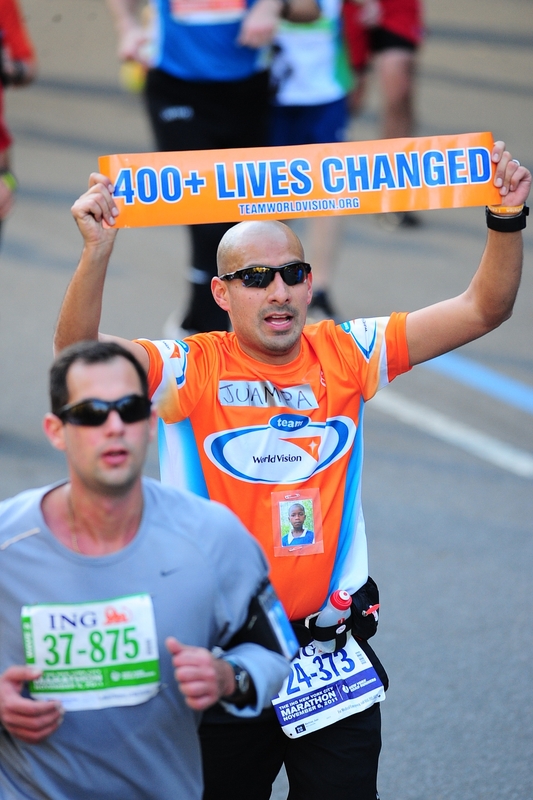 You rallied and inspired amazing individuals to create an incredible team – 400 lives changed! Your Story totally has me tearing up!!! Thanks for all your heart and hard work!! Truly truly, one child at a time, World Vision is changing the world!!!! I love this man! Thanks for taking the time to share it. Thanks for all you do. 400 lives changed in Africa. 25 runners in the US. and one bus driver who knows that there are good people who won’t tolerate racist idiots. you da man! Legendary. Great words Juampa. Thank you. Heartfelt, moving and passionate – that sums you up too! Your words are being shared all across Australia too!